Thursday morning, I got up at 3:30 AM and met my buddy Craig Vander Galien downtown Chicago to attempt some sunrise photos with the Chicago Harbor Lighthouse. It is my personal goal to make a unique photograph of each lighthouse that surrounds Lake Michigan by the end of 2017. I started the journey in early February with the Michigan City Lighthouse and have photographed over 20 since then! Here is a map of the Lighthouses I made that I plan to visit before the end of the year, color-coordinated by state. I have thought for awhile on how best to capture the Chicago Harbor Light and decided that a sunrise would be best. I figured out that the Northeast corner of the Buckingham Fountain was the best place to observe from. Triangle “El”: This means “delta” elevation, or change in elevation. Sun +0.52°: The angular height of the Sun above(+)/below(-) the horizon. The Sun is ~0.50° wide in the field-of-view. So at +0.52° the Sun has just risen, in full, above the horizon. Using longer focal lengths, the size of the Sun changes in the frame. Using a larger distance, and a longer focal length together you can make the sun look HUGE compared to the lighthouse. If you were right next to the subject (lighthouse, in this case) and used a big zoom lens, the Sun would be incredibly large but you couldn’t fit the lighthouse in the frame. Distance is key #1. Δ Elevation is measured from the red to the grey pin. A negative change in elevation means it is going down from red to grey. This negative change allows me to be higher than the Lighthouse and see over boats/breakwaters/obstacles that could get in the way, from the viewing location of Buckingham Fountain. Next, I needed to figure out what focal length I would need to capture the lighthouse at a reasonable size. 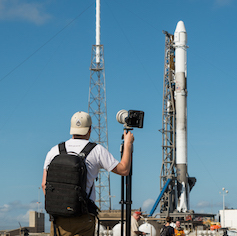 At 2.7 km (1.67 mi), using an 8mm fisheye, 24-70mm, or 70-200mm lens aren’t going to be enough. The exact focal length necessary can be calculated easily using the website ScenePlanner. This sounds complicated, but it is just asking you whether you will be taking the picture vertically or horizontally. Voila. You are given the required focal length (lens) you would need to use. Given my inputs/distances/heights, I would need the equivalent of a 1000mm lens. The highest focal length lens I own right now is a 75-300mm kit lens. This wouldn’t be enough. Someday, I will own one but for these Tom Jones, a real close friend of mine, and fellow photographer entrusted me with his Canon 500 f/4 and 2X teleconverter (500mm X 2 — 1000mm equivalent) so these photos would not be possible without his trust and his help. For some of the first couple, they are taken at a 35mm equivalent of 1600mm. I use a Canon 7D Mark II (APS-C, or “crop sensor” camera) that lends a 1.6X crop factor to any lens that you pair it with. It doesn’t utilize the full image circle created by the lens, like full-frame cameras do (Canon 1D, 5D, 6D). Here’s a few of my favorites that I was able to capture! This was the first photo I took, at 5:10 AM five minutes before sunrise. The glow of the approaching Sun is visible. First light. I thought that sliver was a cloud right on the horizon, illuminated by the Sun underneath it since it was so flat. That flat little sliver is the Sun. Obvious now. Here comes the Sun. Gametime. Part of me enjoys them, part of me wishes the frame was clean. I ended up moving around a bit, getting some of both. Taking the 2X teleconverter was a good idea. “Zooming out” if you will, to see more of the scene. The reflections off the calm Monroe Harbor were awesome. I’ve captured it with the Sun, now I have to capture it with the Moon… and keep working towards purchasing my own 500mm f/4L someday. Help me continue my lighthouse journey this year!